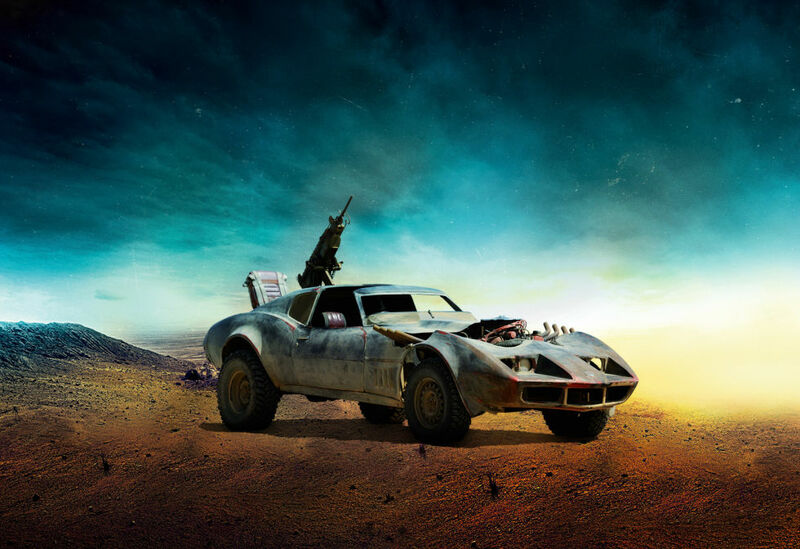 Mad Max: Fury Road will be released next week and, just like the last Mad Max film 30 years ago, there’s plenty of sweet, post-apocalyptic rat rod metal to be found on screen. And from what we’ve seen it seems the new Mad Max film might actually have Furious 7 licked for the sheer amount of cars crammed into the film: there’s supposed to be 130 cars and bikes and 198 stunts. Yeah. Of those cars, the Gigahorse and Buggy #9 have to near the top of the list. This is probably one of the wackiest yet coolest automotive creations we’ve ever seen. Its body is made of two — yes, two — 1959 Cadillac Coupe De Ville’s stacked on top of each other, the lower one widened slightly in order to fit the upper car. The whole glorious mess is powered by two supercharged V8 engines connected by a planetary gear, and it sits on a massive monster truck chassis with a giant cow catcher/ plow at the front for good measure. A C3 Corvette riding on a truck chassis? Yeah, Buggy #9 has to be one of the most badass C3 Corvettes we’ve ever seen. Then again, that might also have to do with the quartet of exhaust pipes hanging out each of the front fenders and the gigantic machine gun mounted out back. The crazy thing is, a car like this actually existed back in the ’70s. The C3 Corvette wasn’t exported to Australia so a company called Custom Peformance Modifications decided to stick a mold of the C3’s body on the chassis of a Holden one-ton truck, according to Road & Track. Known as the Perentti, the vehicle’s truck chassis had a 120-inch wheelbase – 12-inches longer than that of the Corvette – so the proportions never looked quite right. As you can see below, that’s certainly not the case with Buggy #9. They look they would be a perfect fit for the next Twisted Metal video game. These things are freaky but in a cool kind of way.